The Epsom Campus marae Te Aka Matua o Te Pou Hawaiki and the wharenui Tūtahi Tonu are central to campus life, welcoming students, staff and visitors onto campus. Find out about their history. The name of the marae - Te Aka Matua o Te Pou Hawaiki - acknowledges the history of the area. Ancestors of the Tāmaki people brought soil with them from Hawaiki. It was buried on top of a hill which is now a part of Te Kura Akoranga o Tāmaki Makaurau. A carved pole marked the spot. This place was highly tapu (sacred) to the early Auckland tribes, especially the Waiohua people who lived on and around Maungawhau (Mt Eden). They came to Te Pou Hawaiki to perform their karakia (prayers) before beginning an expedition and again on their return. The tuahu, or sacred altar, was located there. In 1973 Mahuta Tuhura, a student at the Epsom Campus, promoted the idea of a marae. 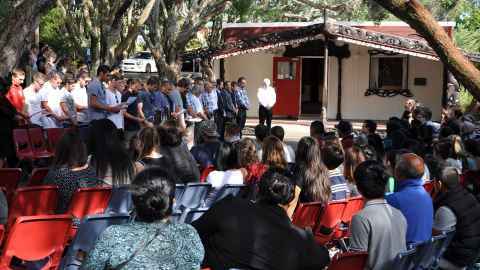 The idea was supported by staff and students within the Māori Studies Department and across campus. Tarutaru Rankin was the Head of Māori Studies at that time, and he was the main driver behind the project. Mark Klaricich was the main carver who completed the project in two years and on Saturday 19 November 1975, the wharenui - Tūtahi Tonu - was officially opened. In July 1996, the wharekai was officially named Te Piringa having inherited the name from the Early Childhood Centre in H Block which had moved to another area on campus.